The tiger is heading toward extinction. Poaching, habitat destruction, and human encroachment on their remaining, isolated territories have devastated a once robust population. Estimates vary, but figures center around 3,200 tigers remaining in the wild. Governments have essentially been unable to stop the trade in tiger parts, ivory, and rhino horn. These magnificent animals are being killed by poachers everyday to satisfy ignorant and greedy consumers. Animals are being killed in zoos and carved up to meet demand. The cartels controlling the international trade in animal parts are too powerful and well connected. Governments cannot, or will not, stop them. The killing will continue. Regarding the tiger, we must put into place a viable option to save the species if efforts in the wild are unsuccessful. Dr. Dale Miquelle, director of the Russia Program of the Wildlife Conservation Society, has had success in Russia’s Far East, home to the Amur tiger. This is due to the vastness and isolation of the region. Human encroachment is not a major problem at present, but the Amur’s area has been shrinking measurably since the late 19th century. Poachers are an ever present concern. Commenting on his success in a Smithsonian article, Dr. Miquelle said, “You don’t get to say ‘I’ve succeeded, time to go home.’ You’re in it for life, and all you can do is do your best, and hand it over to the next generation.” Will the next generation and the next be up to the task? If not, the Amur could face extinction like the South China or the Caspian. World renowned tiger expert Dr. Michael Bleyman had a plan that most field researchers and conservation organizations despised. 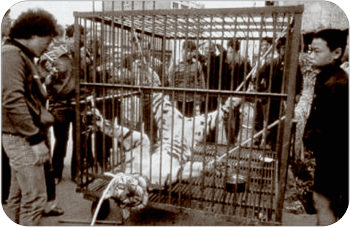 Use a carefully supervised, genetically sound, captive population of generic tigers to save the species. Unfortunately Dr. Bleyman passed away in 1996 before he could implement that plan. It remains a viable option to save the species.